This presentation of the priorities for followers of Jesus Christ describes what is of greatest importance for living a faithful and Christian life. Designed to acquaint the reader with the central tenets of biblical faith, the book draws from historical Baptist doctrine. Offering different aspects of the personal faith of the author, a Baptist pastor, each chapter begins with a statement of belief, including "I Believe in Prayer," "I Believe That Jesus Saves," and "I Believe in Christian Living." True Christian belief means centering one's entire life on Jesus Christ. 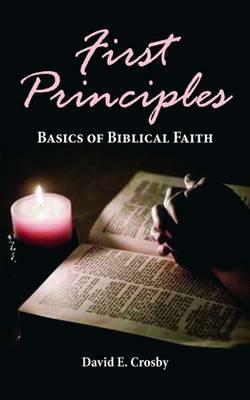 Designed to help people identify and understand the basic teachings of the Bible and tenets of the Christian faith, this book, a tool for spiritual growth, presents the ideals central to living a Christian life in a clear and straightforward manner. Drawing from historical Baptist doctrine, the author, a longtime pastor, offers his personal confession of faith as a means to instruct believers in the most important doctrinal teachings. Each chapter begins with a statement of Christian truth, and principles covered include belief in the saving power of Christ, belief in baptism, and belief in witnessing, as well as belief in family worship and the Lord's Supper.